...Keeping with the topic of fattening food from my last post, I came across a brief story that mixes in the issue of immigration and speaking English while ordering a heaping serving of dead cow. ...The editorial staff at the Philadelphia Inquirer is offended at the management of Geno’s Steaks—the other cheese-steak joint in Philly, aside from Pat’s—because Geno’s is taking food orders in English only. It looks as if the Inquirer staff wants the fine folks at Geno’s to learn Spanish in order to become a more diverse cheese-steak establishment. ...In their editorial on the matter, they attempt to make Joe Vento, Geno’s owner, look like a hypocrite because his grandparents were from Italy and spoke limited English. Unfortunately, in an apparent effort to look chic among the politically correct cliques, the Inquirer seems to brush aside Vento’s grandparents’ lack of whining about their language barrier—instead the folks from the old country took the initiative to learn the language of their new home. 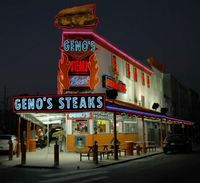 ...The paper concludes by calling Vento’s policy “boneheaded” and suggests that it might put Geno’s out of business. For some reason I seriously doubt that Geno’s is going to go belly-up because they don’t take a few orders in a language that their employees might not even understand. ...What’s most interesting is to see that for a newspaper which is so supportive of others catering to non-English speaking people, I can’t seem to find a Spanish edition of the Inquirer. What’s this? They don’t accommodate Spanish-speaking customers? Wait, why does the Inquirer even CARE? Who are they to say that an eating establishment ought to do one thing or another? Apparently a lot of people in Philly are jumping all over this issue. While trying to pick which of my next 25 grad assignments I’m going to do (all due within the next two and a half weeks), I found an update to this incident in an AP story. Instead of walking across the street to Pat’s Steaks and ordering in Spanish they’d rather sue and see the place burn down? I’m getting flashbacks to the guy who whined when he didn’t get a Mother’s Day bag. That's so funny...no Spanish version of the paper. I let out a laugh...no kidding! I find the part about hoping the place burns down rather disturbing. That goes beyond the line of being upset over a language issue into a psychologically gray area where I worry that this guy needs to find another outlet for his frustrations. And yeah, it is a LOT like the guy who wanted a bag for Mother's Day. Sheesh. It seems to me that there should be a blog out there for dumb lawsuits and/or criminals since there doesn't seem to be a shortage of them. one out of every four or five people on earth is chinese... why the effing moo goo gai pan isn't the "newspaper" bitching about restaurants taking orders in mandarin? we need a constitutional amendment: english needs to be the official language of this country. if people sue because they order in spanish and they can't service, what the hell? i am sure the next person in line will offer to pay in pesos and then sue becaus the restaurant refused to accept it as legal tender.